Sleep in comfort with this Beautyrest ultimate protection mattress Protector. Perfect way to extend the life of your mattress. Enjoy the softness of this 400-thread count mattress pad from Beautyrest. This topper is made from both polyester and Pima cotton and is completely machine washable. Hypoallergenic and antimicrobial, this pad is designed to help reduce allergens and provide you with a better night of rest. The Beautyrest Pima Cotton Mattress Protector Full Size has many exciting features for users of all types. 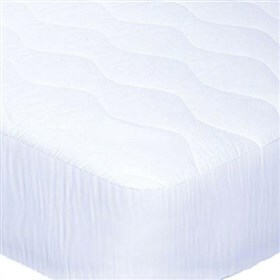 The Beautyrest Pima Cotton Mattress Protector Full Size is sold as a Brand New Unopened Item.